In the past (and even by many people) it has been thought that the universe was something static, something that did not change. The stars have always been there and have always been the same in the same position. This is something that could not be more wrong, the universe is a changing entity. Nature is in constant motion. Looking at it from a physical point of view is a system in continuous evolution and looking at it a little more closely, it is a system full of different potentials that, for the least energy, try to match. In the image we have an example, the tadpole nebula about 12 thousand light years from here (not far, but not too close) in the constellation of the Ursa Major (so you can locate). It is not visible to the naked eye and the image that I put is colored. What we see is very condensed stellar dust dragged by the solar winds and united by the gravity of the dust itself leaving us a birthplace of stars. It is what is called a hatchery of stars where, in billions of years, we will have new companions. In fact, it is a young place since it is estimated to be around 4.5 million years old (its age), similar to the current age of our star (which is in its middle age) but which is something very young for training Of stars. Gravity is slow, but never stops. 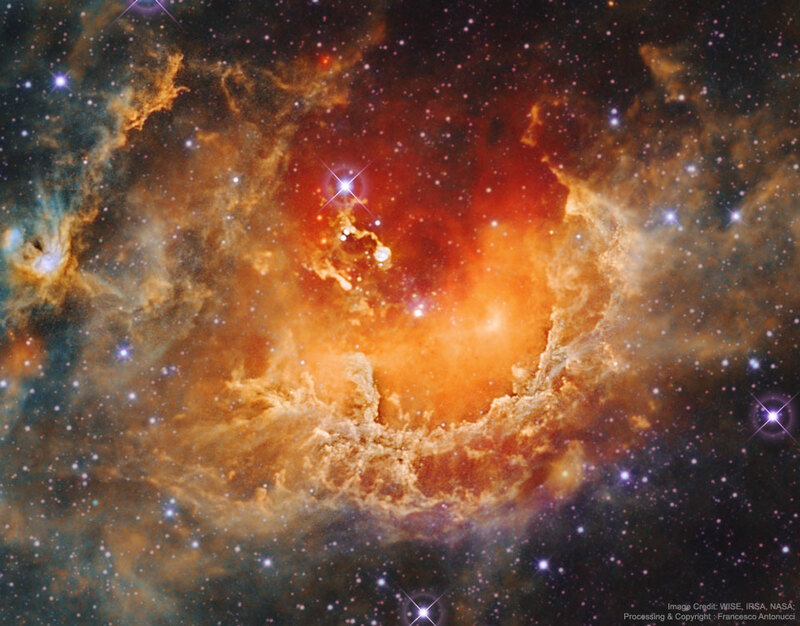 The orange color of the image is chosen by the hydrogen concentration and is about 100 light-years radius, which indicates the large amount of material we have.